Are the claims made in this graphic accurate? the source cited was a book (The Media Monopoly by Ben H. Bagdikian), but I have no convenient way of obtaining it legally at the moment. That inforgraphic and the corresponding headlines were exaggerated and used old, available data to present a simplified picture of the media market to illustrate the "illusion of choice" and encourage people to be aware of who really owns the news they watch and read. It was never meant to be a detailed or comprehensive take on who controls the information. As a dad (and blogger) I’m concerned with the integrity of the news and entertainment my family and I consume every day. Who really produces, owns and airs the shows my kids are glued to every evening and which companies select the stories I read with such loyalty each morning? I’ve always advocated for critical consumption, and what could be more important than an awareness of the sources of our families’ daily info and entertainment diets? 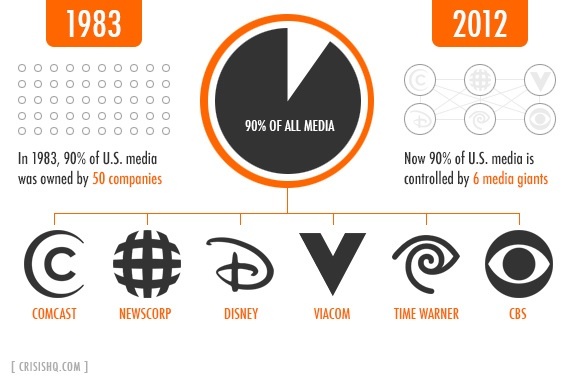 And today, most of our media is controlled by one of six companies. After much searching, the original source for this claim comes from the book, The Media Monopoly (later revised to The New Media Monopoly in 2004) by Ben Bagdikian. He was a fairly respected journalist, although clearly left-wing and biased against large corporations. The book is similarly slanted, and while he has credible sources for some claims in it, there is no source or footnote given for his claim that the “Big Five” control the media, or 90% of it... The original “source” seems to be the opinion of Mr. Bagdikian! For a more accurate take on what companies have what share of the media market, consult these spreadsheets from the Free Press in 2018. Mathematically, the claim of 90% control by the Big 5 doesn't hold any water. For example, Sinclair controls the largest number of broadcast TV channels in the US, but they are not considered one of the Big 5. On the Pay TV Channels tab, you see the Big 5 representing the largest number of networks, but the competition represents 25% of the market. Did Fox News win a court case for the right to lie?